There was a great discussion on Facebook last week of advertisements for the return of runaways. In this case, not ads the initial poster was used to seeing — not ads for the return of runaway slaves. Ooooooh… a question for The Legal Genealogist. Because, of course, the answer lies in the law. 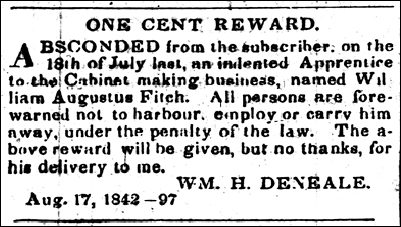 Now… it’s pretty clear that if he’s only offering one penny for this young man’s return, and “no thanks” … William Deneale really doesn’t want William Augustus Fitch back at all. So why advertise at all? Because without it masters like Deneale could legally be obligated for damages that apprentices like Fitch caused to others and things that they bought and charged to their masters. Advertising didn’t, and couldn’t, break or end the indenture — that legal contract between master and servant — by itself. But it put the community on notice that the servant wasn’t acting on the master’s behalf, and provided protection for the master if someone else tried to sue for damages caused or debts incurred by the servant. And, of course, the best part of these ads is… they’re records. Records we can use to add to our family history… records that surely add color and depth to the story. I mean, seriously… who wouldn’t want proof that “an apprentice boy, by name William Wilson … was 17 years of age last July, and is a stout, well grown lad…”?9 At a time and in a place where proof of age and anything remotely resembling a physical description is hard to find, these ads — and others like them — are pure gold. Here is an ad I found when I did research at the American Philosophical Society in Philadelphia. French Neutrals were Acadians who had been deported and exiled from their lands in Nova Scotia (Originally Acadia). N.B. All masters of vessels are forbid to carry him off at their peril. That guy definitely wanted his apprentice back!! “Four dollars and reasonable charges” was a lot of money in 1768. This is fascinating — wonder if it’s applicable in England as well. There was a recent episode of Who Do You Think You Are when an apprentice absconded at age 15, 5 years into his apprenticeship as a shoemaker, and joined the Royal Marines. When discovered (presumably because his master sought him out? ), he was prosecuted for “Being An Apprentice, For Enlisting and Defrauding His Majesty of 11 Guineas.” He was sentenced to 12 months hard labour. So nobody benefited: the master lost his apprentice, the Marines lost their recruit and the apprentice went to prison. Yes, the same rules would have applied in England: Blackstone was writing about the English common law, which we here in the US generally incorporated into our laws. Wow, Judy! Great post, and (believe it or not) I’m most impressed by your citations! Boy, have I got a lot to improve upon in that department! So, the focus on the word, “indented” really stands out for me, here. I wonder (and I know you’ll tell me) if that is the reason I’d not seen these ads for runaway apprentices before? As I mentioned in the Facebook comments, I’ve spent a lot of time working with apprentice records, because one branch of my family was apprenticed, extensively, in Tyrrell County, NC. I don’t recall if the word indenture was used in the language of the bonds, or not. I’ll have to go back and take a look. (I am pretty sure, though, that at least some of the originals do begin with, “This indenture”.) What I do know, though, is that in the case of all of the apprenticeships I’ve had reason to study, they involved free people of color and/or their base-born children, and were incurred because of NC law. Perhaps, in those cases, runaways were less prevalent. I’ll definitely be revisiting some resourcesto gain a better understanding of the variations in the apprenticeship system! Thanks for your additional research and for sharing your knowledge and legal expertise with all of us. There were essentially TWO system of indentures, Renate: one a voluntary system (these youngsters learning a trade) and the other largely involuntary (youngsters who were bound out because they purportedly didn’t have parents who could care for them). I say “purportedly” there because, as you know, in NC and other states, free children of color were often taken from their parents — involuntarily and often over the parents’ objection — and bound out, particularly in the years just after the Civil War. It was, in essence, a way to keep the children in servitude even if the parents were technically free. I’d be very interested to know what your research showed was the difference antebellum and post-Civil War, Lisa — other than, of course, the fact that North Carolina defined all children of former slaves as base born children in order to bind them out immediately after the war. I liked your explanation of the Master wanting to absolve himself of any harm done by the missing apprentice. I may be confusing the terms Indentured apprentice with indentured servant. I thought I had seen some contracts between a master craftsman and an apprentice’s father where the Master was expecting to benefit from having the apprentice at his beck and call. I got the impression that the apprentice was treated as cheap labor and learning the craft was secondary. I can see where sometimes the Master would hold an apprentice to the original contract and other times, good riddance. An indentured servant, without more, have have simply been working off a debt (such as the cost of passage from old world to new). An indentured apprentice carries with it a suggestion that this is a youth being trained. Yes, during the years of the apprenticeship, the master was entitled to the youth’s work, but the notion was to get the kid trained in a craft for adulthood. In some cases, a parent would even pay to have the child accepted as an apprentice. Indentureship problems. I loved this one! Another thing I have found over and over. The “master” abused the indentured child (normally a child) and made life miserable for him. If the master could drive off the child, he would go to the County and say “hey, I know I was supposed to provide this boy with a horse, a new suit of clothing at the end of his indentureship, but he just got up and run away on me. So, I should not have to live up to the contract.” It happened many times and the county usually saw right through it. But, it legally protected him if he went to the officials. Yes, the legal obligation to pay what were called freedom dues was part of what the master was trying to get out from under.